Primarily, the fluid in brake systems is a hydraulic fluid, but it must also lubricate the elastomer seals in the wheel cylinders and calipers as well as protect system metal parts against rust and corrosion. In practice, it has been found almost impossible to exclude moisture completely from brake systems. To prevent this moisture from collecting and freezing in cold weather or causing rust and corrosion, which can cause brake failure, the usual approach is to use brake fluids that are miscible with water. Petroleum-based fluids do not meet this requirement, so most brake fluids are based on glycols (alkylene glycol and alkylene glycol ethers). In operation, considerable heat is transmitted from the friction surfaces of the brakes to the fluid. If this raises the temperature of the fluid sufficiently to cause vaporization of some of the fluid, braking effectiveness will be reduced because of the compressibility of the vapor. The problem may be more severe with disc brakes, because the smaller areas and higher pressures of the friction pads may result in higher operating temperatures. With higher brake pad temperatures, more heat is transferred through the wheel calipers to the brake fluid. The absorption of moisture by a brake fluid lowers the boiling point, because water boils at a lower temperature than the glycols used as a base for brake fluids. For this reason, brake fluid specifications include both an equilibrium reflux boiling point, which is the boiling point under reflux conditions of the pure fluid, and a wet equilibrium reflux boiling point, which is the boiling point of the fluid when it is contaminated with a specified amount of water. To some extent, the amount that these boiling points can be raised is restricted because higher boiling point glycols also have higher viscosities at low temperature and may not provide satisfactory brake performance in cold weather. The most widely accepted brake fluid specification is the U.S. Federal Motor Vehicle Safety Standard (FMVSS) No. 116, which outlines the requirements of the Department of Transportation (DOT) brake fluid grades. Fluids meeting this standard generally are suitable for all normal brake systems designed for nonpetroleum fluids over a wide range of vehicle applications. FMVSS 116 defines the minimum dry and wet boiling points and the viscosity parameters of the DOT brake fluid grades among other things, such as elastomer compatibility and corrosion performance. DOT 3 fluid is glycol based and is used in most cars and light trucks under normal driving conditions. It also meets the requirements of the SAE Standard J1703, Motor Vehicle Brake Fluid, which is generally similar to the DOT 3 Standard, but somewhat less restrictive in its requirements. DOT 3 fluid has the lowest minimum dry and wet boiling points as defined by FMVSS 116. 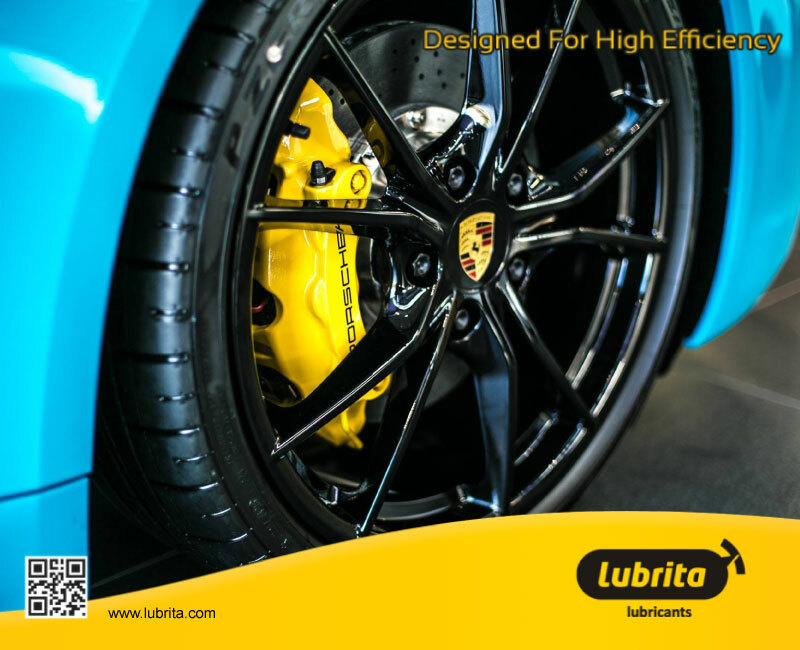 Some manufacturers specify a higher boiling point fluid for vehicles with disc brakes; and higher boiling fluids may also be required in certain types of severe service, such as mountain operations, particularly in hot climates, and road racing. DOT 4 fluid is used in these applications. It is also glycol based, but it contains borate esters to increase the dry and wet boiling points. DOT 4 fluid will also meet the requirements of SAE Standard J1704. DOT 5 fluid is silicone based and does not absorb water the way that the glycol-based fluids do. It is sometimes referred to as a “low water tolerance fluid” or LWTF. DOT 5 fluid is generally only used in vehicles with intermittent usage that sit for long periods as well as in some military applications. DOT 5 fluid should not be mixed with any other DOT fluid as their compatibility cannot be guaranteed. DOT 5.1 fluid is a glycol-based fluid that meets the high minimum dry and wet boiling points of the DOT 5 silicone-based fluid. It is reserved for the most severe of applications such as heavy tow vehicles or race vehicles. DOT 5.1 fluid is compatible with and can be safely mixed with DOT 3 and DOT 4 fluids. Most brake fluids contain dye to aid in leak detection, but there is no industry standard for brake fluid colors. As a result, the color cannot be used to distinguish between the various DOT brake fluid grades. Commercial brake fluid colors include clear, pale yellow, crimson red, blue, purple, and violet. Color does not affect the quality or performance of the brake fluid. In service, it is important that every precaution be taken to keep brake fluids as clean and free of moisture as possible. Containers should be kept sealed when not in use and should never be reused. Master cylinder reservoirs should be kept filled to the proper level because this minimizes the amount of breathing that can occur. Reservoir caps should be replaced properly after the fluid level is checked or fluid is added. A number of manufacturers use translucent plastic reservoirs so fluid levels may be observed without removing the cap. This method reduces the possibility of contaminants being introduced into the system.